Possible planets of the Gliese 581 system, superimposed on a picture of our own solar system to compare orbital distances. Gliese 581c is a super-Earth planet that was discovered in 2007. It resides in the Gliese 581 system, which at 20 light-years from Earth is relatively close to our planet (in celestial terms). While early research suggested that Gliese 581c may have liquid water on its surface because it resides in its star's "habitable zone," more recent research suggests it may have a Venus-like environment. The existence of Gliese 581c was announced in 2007 in the journal Astronomy and Astrophysics. The paper was led by Stephane Udry, an astronomer at Geneva Observatory. Gliese 581c was one of two super-Earth planets his team found, both at the edge of the star's habitable zone. While Gliese 581c was classified as Earth-like, the researchers cautioned that actual conditions on the planet may be very different than our own. The surface temperature, for example, would depend on the composition and thickness of the atmosphere. The atmosphere also determines how much light is reflected off the planet, and the magnitude of the greenhouse effect. The parent star of Gliese 581c, called Gliese 581, is an M-class dwarf star. It's cooler than the sun, which means its habitable zone would be closer in than our own solar system. M dwarfs are favored for planetary searches because they are dimmer, meaning that planets passing across the star would be easier to see. There also is a smaller relative size between the planet and the star, making their gravitational effects more obvious. 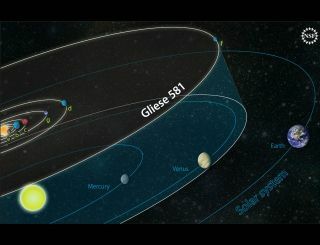 Researchers examining Gliese 581 have had different opinions over the years about how many planets were there; one example was the discovery of Gliese 581g in 2010. Signatures of the planet did not show up in independent searches, and today most astronomers in that field consider that the planet does not exist. Not knowing the number of planets exactly makes it difficult to determine the radius of Gliese 581c. The planet has not been seen directly passing across the face of its star, so astronomers can only learn about its characteristics from Gliese 581c's influence on other planets and the star. The radius would in turn determine such matters as whether the planet is closer to an Earth-like planet (with a smaller atmosphere) or closer to a Neptune-like planet (with a much thicker atmosphere). Gliese 581c takes about 13 days to orbit its parent star. (By contrast, Mercury's orbit around our much larger sun takes about 88 days.) Because Gliese 581c is so close to its star, a common belief is that the planet is tidally locked. This means that as it orbits, the planet always keeps the same side toward the sun. This phenomenon is common among moons of Jupiter and Saturn in our own solar system. Earth's moon is also tidally locked to our own planet. If a planet is tidally locked, this means that one side (the star-facing side) is always warmer than the other side (which always faces away from the star.) Any considerations of habitability would have to take this into account. The only firm example of a habitable planet that we know of – our own Earth – has a regular day-night cycle in most areas of the planet, except the poles. Over billions of years, lifeforms have adapted to this cycle. It's unclear how life would survive in an area of perpetual day or perpetual night, but studies are ongoing. A 2007 follow-up paper in Astronomy and Astrophysics, led by Werner von Bloh at the Potsdam Institute for Climate Impact Research, suggested that Gliese 581c is too hot to support life because it is so close to its parent star. This means that the planet may have more of a Venus-like environment, with an extremely hot surface and a runaway greenhouse effect under a thick atmosphere. This was confirmed in a 2011 study in Astronomy and Astrophysics led by Y. Hu, who is with Peking University's laboratory for climate and ocean-atmosphere studies. While Gliese 581c has not been discussed much in scientific literature in recent years, astronomers are working more generally to improve their models of planets that are close in to their parent stars. An example is a 2013 article published in the journal Nature, in which a team led by Jeremy Leconte examines the conditions under which runaway greenhouse effects happen on Earth-like planets. This line of research is receiving increased attention again after the discovery of Proxima Centuari b, a potentially habitable planet just four light-years from Earth, in 2016.